So I had a Hurricane at Pat O’Brien’s and it tasted like someone had mixed rum and simple syrup with a package of cherry Jello mix. Horrendous. So what’s in the Hurricane mix? Reading from the package: Sugar, citric acid, xanthan gum, artificial flavors, fruit and vegetable oils, tri-calcium phosphate, and food coloring. In other words, the awful Hurricane I had was basically a glass of cheap rum and nasty chemicals. No wonder it tasted so bad. You can actually buy a 9-oz. 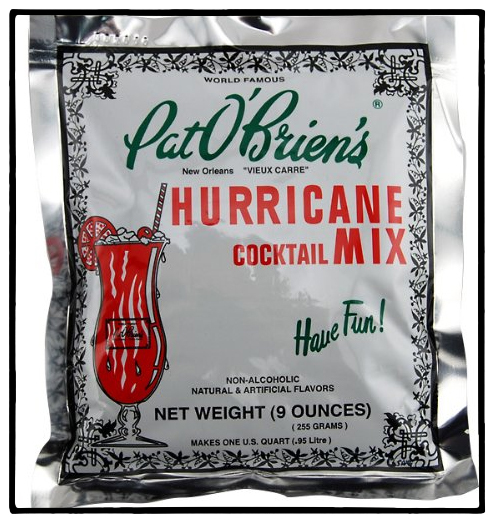 package of Pat O’Brien’s Hurricane Cocktail Mix (“Have Fun!”), which makes about a quart, and is the same stuff they use at the bar, but why would you? My go-to cocktail recipe book, drink’-ol-o-gy: The Art and Science of the Cocktail, actually has a pretty good recipe for the Hurricane, although it calls for half an ounce of passion fruit juice, which is actually almost impossible to buy (most such tropical juices are blends that include other fruit, like mango, pineapple, etc. ), so you’d probably have to juice your own passion fruit, if you could even find passion fruit. I think the thing to do is buy passion fruit syrup; both Moni and Torani make excellent passion fruit syrups. Pour all ingredients into a shaker half-filled with crushed ice; strain into an ice-filled Hurricane glass. Garnish with an orange slice and cherry. Waiters outside Pat O’Brien’s in New Orleans. Photo by David Lansing. Well, I’m a first-time tourist in New Orleans and I’d hate to drag down the 95 percentile, so I decided to search out Pat O’Brien’s which, according to the story I’d read, is the bar that invented the ‘Hurricane’ cocktail. 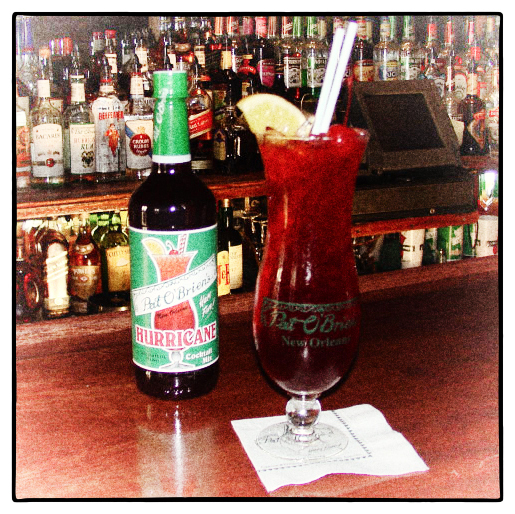 Only problem was, I’d never heard of a Hurricane cocktail. But I was guessing that, like most drinks given strange tiki or tropical names, it had something to do with rum and sickly-sweet fruit juices. Which it did. Pat O’Brien’s, which opened its doors on Dec. 3, 1933, just before the repeal of Prohibition, started out as a speakeasy with the password, “Storm’s brewin’.” In 1942, it moved to its present location at 718 St. Peter Street. Pat O’Brien was a bootlegger in Louisiana and Mississippi who, so the story goes, passed through New Orleans, got stuck there, and opened a small package liquor store/speakeasy. 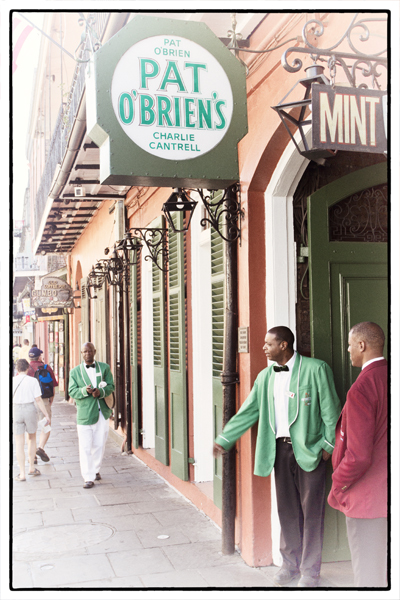 He was a retail dealer and his eventual partner, Charlie Cantrell (whose name you see on the bottom of the Pat O’Brien’s sign), was a wholesaler. 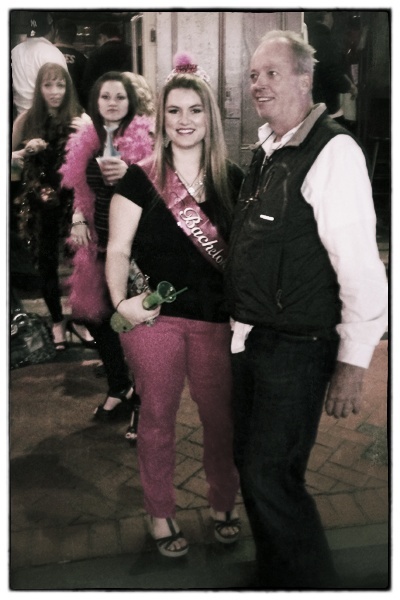 They had met on Louisiana’s Bootleg Highway during Prohibition. The way the bar tells the story, during WWII there was a real shortage of bourbon and scotch, and the whiskey companies sent “missionary men” out with regular salesmen and coerced bar owners into buying large quantities of the harder-to-unload rum in outrageous amounts. Sometimes the bar owners would have to agree to take 40 or 50 cases of rum in order to get the bourbon and scotch they wanted. It’s not yet noon and there’s hardly anyone at the bar. Nonetheless, what few tourists there are are all drinking Hurricanes. So I order one as well. And here’s what I can say about the drink that 95 percent of all first-time tourists drink in New Orleans: It is the worst cocktail I’ve ever had. Jackson Square Parkbench performing in New Orleans. Photo courtesy of a passerby. Like I said, some guys were playing music in front of the St. Louis Cathedral. They were playing jazzy versions of Christmas songs. “Santa Clause Is Coming to Town,” “Frosty the Snowman,” that sort of thing. Even though they were all playing the same song, they weren’t playing together. It’s like the saxophone player knew one version of Frosty and the trombonist knew another and the tuba player and guitarist knew different versions. They didn’t seem to care that they weren’t in sync. They were just doing their own thing. Together. The saxophone player saw me watching them and told me to come sit down. “Come on, now. Come join us.” He patted the empty spot on the park bench between him and the trombone player. I sat down. “You sing?” asked the saxophone player. He counted down and then launched into an up-tempo version of “Let It Snow.” When they got through the opening, he turned to me and nodded. I sang. The trombone player shook his head and laughed. So did the tuba player. But the saxophone player just nodded his head at me and kept on playing. I guess I’m in a New Orleans band now. I think I’ll call the band Jackson Square Parkbench. 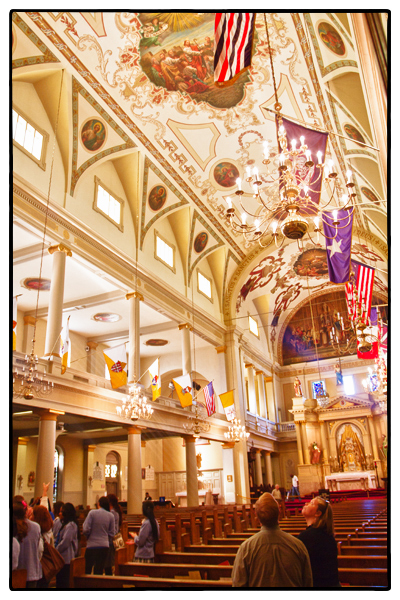 St. Louis Cathedral, New Orleans. Photo by David Lansing. I was supposed to go fishing with some of those knucklehead crackers I was talking about the other day but I just couldn’t do it. Made me sad to even think about. Instead, I got up late, had two cups of coffee down in the bar of the Hotel le Marais, and then walked down to Jackson Square. 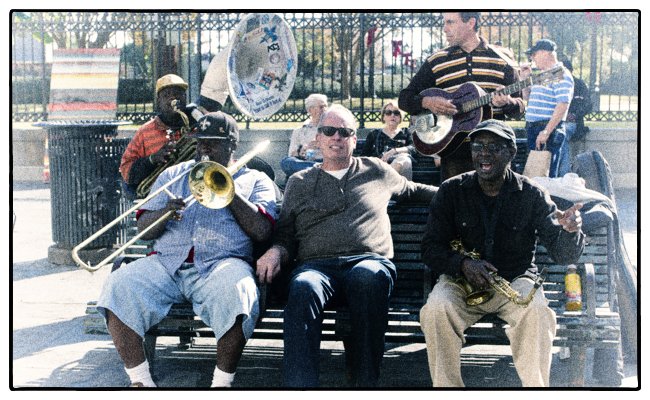 Some guys were playing music in front of the St. Louis Cathedral. I listened to them a bit and then I walked in to the cathedral and sat down in one of the pews in the back. In the aisle was a group of high-school-aged Catholic school girls wearing blue, long-sleeve blouses, listening to a tiny little nun who spoke in a whisper. I couldn’t hear what she was saying. But the girls in their crisp blue blouses would crane their heads in unison following the tiny nun’s uplifted arm as she pointed to a painting on the dome of the cathedral or maybe one of the flags hanging down. A tall, pale, gangly girl with a ponytail tied with a white ribbon, yawned, with exaggeration. “Jesus,” she drawled and then clapped a hand to her mouth as her eyes got big. The other girls all tittered and spun to face her. The little nun looked hard at the gangly girl but didn’t say anything. “I’m sorry, sister. It just came out!” said the gangly girl. A few of the girls, tired of standing, sat precariously at the edge of the pews, as if prepared to jump up at any moment. One of the girls saw me watching them and stuck her tongue out at me and then quickly turned around. An elderly couple, whispering to each other, sat down in the pew five or six feet away from me. The woman, who had a tight bun of white hair piled on her head and was wearing a puffy purple jacket, had one hand on the old man’s arm and was talking to him rapidly in French while he slowly nodded. Something she said to him made him very sad for his eyes got moist and he took out a perfectly pressed white handkerchief and handed it to the woman who dabbed at the corners of his eyes, as if he were a child who’d gotten sand in them. I don’t know why, but I kneeled. I clasped my hands as if I were going to pray but I wasn’t praying. I was thinking of someone I knew and I then I started to wonder why I had started thinking about that person, since I hadn’t thought about them in a long while—no, that was a lie. And then I realized that the tall gangly girl who’d murmured “Jesus” after yawning reminded me of her. Not in the way she looked or anything but just by the way she stood there. All loose limbed. Like something just awakened. Like a cat stretching on her way out the door.